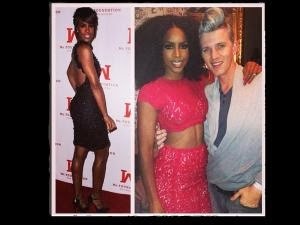 When popular US singer Kelly Rowland attended a charity event in Beverly Hills in the US this week, she was the most talked-about person there. Not because of her celebrity status, though, but because of the stunning black dress that she wore. The US media went crazy when Rowland arrived and next day, the former Destiny’s Child member was splashed across several newspapers. What most people don’t know is that Rowland was wearing a dress designed by South African designer Gert-Johan Coetzee. Coetzee designed the dress in September when she came to South Africa for a private show. Having been so impressed with the dress, Rowland’s people have contacted Coetzee to see if they can continue to work with him in the future. Coetzee said he had been delighted when he found out that Rowland had chosen to wear his dress for an event. Rowland posted a picture of the dress and a picture of her and Coetzee on picture application Instagram this week. The picture got 13 000 likes in the first few minutes of it being up. “It is such an honour to be able to fly the South African fashion flag internationally,” said Coetzee. He said that the dress was made from antique beaded silk and was 90 percent hand-stitched. He was excited at the prospect of working with Rowland in the future. Coetzee has designed dresses and other clothing items for several celebrities. He considers Rowland the biggest celeb to wear his design. Coetzee has been one of the most successful fashion designers in South Africa in the past five years.